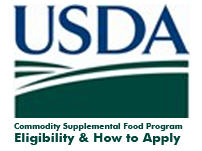 The Commodity Supplemental Food Program (CSFP) is a Federally funded program, which works to improve the health of low-income elderly people at least 60 years of age by supplementing their diets with nutritious United States Department of Agriculture (USDA) foods. 97% of CSFP participants at the Federal level are over the age of 60. South Dakota participants are all over the age of 60 with an income at or below 130% of poverty. CSFP is administered at the Federal level by the Food and Nutrition Services (FNS), an agency of the USDA. Here you will find a summary of the benefits and services available to those who are eligible to participate in this program. To view a copy of the CSFP Program Description Fact Sheet, click here. USDA purchases food and makes it available to CSFP State agencies along with funds for administrative costs. State agencies obtain the food and distribute to public and non-profit private local agencies for distribution to eligible individuals. Local agencies determine the eligibility of applicants, distribute the foods, and provide nutrition education. Local agencies also provide referrals to other welfare, nutrition, and health care programs such as SNAP, Medicaid, and Medicare. CSFP food packages do not provide a complete diet, but rather are good sources of the nutrients typically lacking in the diets of the target population. Aurora, Beadle, Bennett, Bon Homme, Brookings, Brown, Brule, Buffalo, Butte, Campbell, Charles Mix, Clark, Clay, Codington, Corson, Custer, Davison, Day, Marshall, Deuel, Dewey, Douglas, Edmunds, Fall River, Grant, Gregory, Haakon, Hamlin, Hand, Hanson, Harding, Hughes, Hutchinson, Hyde, Jackson, Jackson, Jerauld, Jones, Kingsbury, Lake, Lawrence, Lincoln, Lyman, McCook, McPherson, Meade, Mellette, Miner, Minnehaha, Moody, Pennington, Perkins, Potter, Roberts, Sanborn, Shannon, Spink, Sully, Todd, Tripp, Turner, Union, Walworth, Yankton, Ziebach. Contact the Child and Adult Nutrition office at the South Dakota Department of Education, (605) 773-3413 with questions.